Discovering the most wonderful luxury travel, soft adventure and culinary experiences worldwide. Travel is all about memorable moments! Eight Gorgeous Napa Valley Wineries You Must Visit! The Napa Valley in northern California is justly famous for its award-winning wines and cuisine. It makes for a lovely travel destination any time of the year. But did you know that many wineries here are worth visiting not just for their wines but also for their unique architecture or art or gardens? So, whether you’re an oenophile or not, buckle up and join me as I take you on a tour of eight gorgeous Napa Valley wineries! These eight wineries are all located either along Highway 29 or along the Silverado Trail, the two main roads that connect the town of Napa in the south of the Valley to Calistoga in the north. So they can all be covered in a few hours, allowing for about twenty minutes in each location, to explore and admire the grounds and architecture or art. Of course, if you have more time to spare, you can linger at each winery and enjoy its beauty at leisure, as also the beautiful drive up and down the Valley. We covered some of these wineries during a summer trip and some during a trip in the fall — and some in both! — so my photos reflect different seasons. All of the wineries on this list are free to visit and look around outside (and take photos!) during the hours the wineries are open. There are other beautiful wineries in the Napa Valley, but they have a fee to enter and are often available to tour only by appointment. Several of the wineries on this list also feature top-notch wines and stunning tasting rooms, so they would make great choices for a tasting trip as well. If you start the drive at Napa and follow the order below, you can drive up Highway 29, and return via the Silverado Trail. Most wineries in the Napa Valley are open between 10 a.m. and 5 p.m., but please check their web sites online prior to your visit. And now, here’s the list! I love the location of Artesa Winery. It is situated on a hill, and from the grounds you get expansive views of the vineyards in the valley below, with the “patchwork quilt effect” reminiscent of Tuscany. On a clear day, you can reportedly see all the way to San Francisco, although on the two occasions we have visited, it was not clear enough. The views were spectacular, both in the summer and in the fall. There are four lovely water features on the property, with contemporary sculptures installed in some of them. Around the sheltered fountain at the lowest level, there are benches where you can relax while you see, and hear, the dance of the water. The water features on the other levels are equally stunning, but there’s no place to sit down. Domaine Carneros also sits on a hill. Although the views of the grounds and surrounding vineyards from the patio at the top are nice, the star of the show here is the winery building itself. Walk down the steps, enjoying the formal gardens on either side, till you reach the bottom. Then turn around and gaze your fill at a scene that could be from the French countryside…an imposing beautifully proportioned chateau with symmetrical formal gardens falling away below. At Domaine Carneros, you can get up close to the vines, and see them breaking into bud in the spring and lush with fruit in the summer. If you choose to do a tasting here, the four-glass flight of sparkling wines appeared to be really popular when we visited in the fall. We saw the flights on nearly every table as we walked by. You’ll know you’ve arrived when you see a sculpture of a giant silver bunny by the side of the road. I love to visit Hall St. Helena for the contemporary art pieces on the grounds and for the sense of humor on the placards that accompany each piece of art. We have not been inside the tasting room, but I have read that there are beautiful pieces of art inside as well. In the summer, you can stroll around the kitchen garden on the grounds, or admire the contemporary infinity pool water feature in the back, where loungers are placed to capture the beauty of the water feature as well as the vineyards and mountains in the background. Beringer was founded in 1876, and, according to their web site, it is the oldest continuously operating winery in the Napa Valley. The winery is listed both as a California Historical Landmark and in the National Register of Historical Places. The Rhine House, originally the Beringer family’s residence and now a tasting room, was built in 1884, and is said to replicate the look of the Beringer family home in Germany. It is a gorgeous structure, with lovely lines and intricate stencil detailing. Beringer also has beautiful grounds. 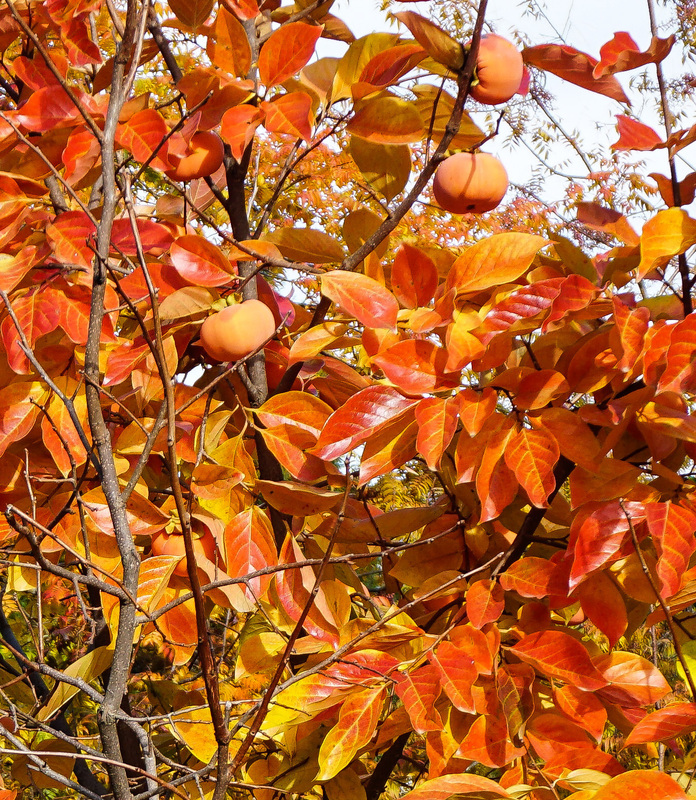 We saw large oleander trees in bloom when we visited in the summer, and a persimmon tree in fruit when we returned in the fall. At our fall visit, hummingbirds were gorging on nectar from salvia blooms, and the vines had turned color to all hues from yellow to burgundy. Complete with a tower, drawbridge, and moat, Castello di Amorosa, built as a replica of a thirteenth century Tuscan castle, will leave you gawking. There are 107 rooms in this castle. You have to pay for a wine tasting to explore the interior of the castle, which includes a dungeon and a huge Great Hall with replicas of Tuscan frescoes and a fireplace said to be 500 years old. Much of the stone and brick used in the construction was imported from Europe. On the grounds, hens run around among the vines, goats show up at the fence to be petted, and the resident peacock may pose for your camera if you are lucky. Parking can be problematic at this winery later in the day and on weekends, although we were able to find a spot both times we visited. Chateau Montelena is located a little north of Calistoga. The winery building is built into the side of the hill, and looks like it’s been there forever. The grounds of this winery are beautiful, with Chinese-style bridges and gazebos over built over Jade Lake. A pair of swans completes the picture postcard scene. Fall colors were past peak when we visited in late November, but the reflections in the lake were stunning. Round Pond wins my vote for the friendliest staff. When we showed up and asked if we could step onto their second story tasting deck just to look around (tastings were fully booked for the day), we were waved in with a smile. The views from the deck are quintessential wine country views, with the Mayacama mountains providing a backdrop for the brilliant yellow vineyards and a red barn. I loved the driveway, with its twin rows of really really tall palms. A round picture window in the showroom offers a gorgeous view of the long driveway. A grove of very mature olive trees on the side of the winery looked like a lovely shaded place to relax, with quaint driftwood chairs and picnic tables. You will probably rub your eyes and stare in disbelief when you first set eyes on this winery, which looks like a scene from the Arabian Nights. The fantasy is further enhanced when you walk around the grounds and see figs, grapes, olives, pomegranates and fragrant yellow roses in the gardens. The winery is built to resemble Persepolis, the capital of ancient Persia. The yellow stone on the facade was actually imported from Persepolis. Be sure to pop inside to take a look at the stunning floor to ceiling indoor water feature! And if you opt for a tasting, try their pistachios. Roasted with sea salt and citrus zest, they are yum! Have you visited the Napa Valley? If you have, comment below to tell me about your favorite winery. If you have not, I hope my post inspires you to visit this beautiful area of northern California soon! What a delightful wine trail. We really enjoy visiting wineries and I would love to visit these. As I read this post, and looked at the stunning photos, I had to double check these wineries were in California. I thought you were in Europe. The Domaine Carneros, Beringer Rhine House, and Castello di Amorousa really caught my attention. Yet the gardens, the architecture, the sculptures, and the vineyards throughout the post all look so beautiful. Thanks so much Estelle! The drive through the Valley is beautiful and these wineries make for really lovely places to stop and take in the art and architecture. Beautiful photos and post. We have been to Napa valley a few times but have not stopped at a lot of wineries – Domaine Carneros and Artesa are on my list – just for the views! The views from both wineries are indeed awesome! 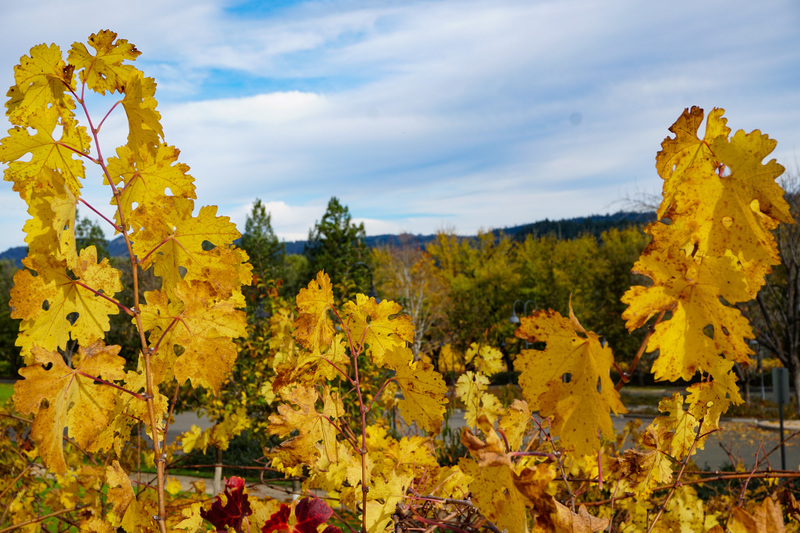 We love visiting the Napa Valley just for the beauty everywhere! These wineries look amazing! I live in a wine region in NSW Australia and in fact I live right next door to an operational vineyard, and never tire of watching the seasons change. Some of these buildings are stunning and your descriptions and direction are very useful and informative. Thanks, Debbie! Wine country in Australia sounds amazing and I hope I get to see it one day! Hi! I’m Dhara. Through this blog, I hope to inspire you to seek out and savor beautiful travel moments. Join my husband and I as we explore the world in search of memorable travel experiences.